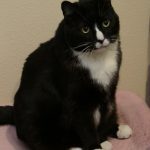 My domestic medium hair Tuxedo cat Mikey was diagnosed with hyperthyroidism in 2014. The options we had involved giving him pills the rest of his life or radiation treatment. Considering how difficult it is to give cats a pill normally, I opted for the radioiodine approach. We had the treatment done 01/05/2015. Since then Mikey has been as active and ornery as he was before. He looks good, eats good, and his activity level is normal. He is almost 14 years old. The treatment and support that we got from the AVMI team was phenomenal. Normally, you can watch your pet on an internet feed, but since my cat was so big (about 18 lbs), he had to go into a much bigger room. This was much more comfortable for him. After we picked him up after the treatment, the AVMI staff was very supportive and did lots of followups. I was very pleased with how they really cared. If you are faced with a similar diagnosis, I would definitely recommend AVMI. They are the best.